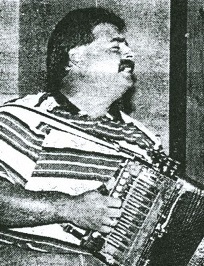 LeBouef recalled the first time he played at Eunice's Liberty coordinator of the statewide FrancoFete '99 celebration beginning in January. "When those curtains opened. I felt like a bullfrog in a pond with the gigger's headlight shining in his eyes." LeBouef said. "To me, it was like playing Carnegie Hall. I was awe-struck at the popular acceptance Cajun music was getting again, and it still feels great every time I go on stage." LeBouef. framed by the stage backdrop of a mural of famed Erath musician and Cajun music ambassador D.L. Menard, launched into Menard's seminal anthem. "The Back Door." a song that's part of the standard repertoire of nearly every Cajun band. The cafe features live Cajun music each Friday and Saturday night.